If you use, or plan to use, the Club Forum then we would urge you to register/login on there and join/renew from the link in your profile box on the top left hand side of the page. When joining or renewing via the forum, the process is fully automated which saves us time and means that your membership details will be updated instantly. The Z1 Owners Club Great Britain was formed in 1989, by Sam Holt following the demise of the Kustom Kawasaki Owner's Club. The Club now has a membership of around 600 worldwide, all with a common interest in the legendary Z1 and it's descendants. The Club originally covered all models of the Z1, Z900 and Z1000 up to and including the Z1-R, but in recent years this has been extended to anyone with an interest in Big Zeds - first generation big bore air-cooled Kawasaki fours which were originally twin shock. Members try and supply mutual support and advice with all models of the Z1, Z900, Z1-R, Mark 2s, Z1000R and Z1100Rs, 1000STs and so on. Also included are the Z2 which isn't over 900 but is clearly a sleeved down Zed, so is eligible, and the GPZ1100 B1 and B2, a bit of a cross-over for Kawasaki but undoubtedly more like Zeds than anything else so they fall within our remit. Once they went monoshock it really was the start of something new. What else counts as a Zed? Well, eligibility can be with either engine or chassis, so that takes in those with Kawasaki Zed engined Rickmans, Harris, Egli, Moto Martin or even Z650 framed bikes, and also Gixer engined Zeds and the like. Whether you're interested in concours bikes and restoration, streetfighters and specials, drag racers or classic racers, if it's Zed based you'll find a friendly ear here. You don't, currently, have to be a member of the Z1 Owners Club to make use of the public parts of the Club forum but if you find it useful, helpful or interesting then joining the Club is the 'right thing to do' - it's only the cost of a tank of fuel or a round down the pub after all and your membership contributions keep the whole thing on the road. On joining the Club, you will gain access to the Members Only sections of the forum and your profile will show other users that you are a Paid Up Member(PUM). Club membership fees go towards supporting the Club website and forum, maintaining a stand at some of the leading classic bike shows to provide members and others interested in zeds a point of contact, and assisting some of the Area Reps to organise rallies. The Club is registered with the leading classic bike insurers allowing you access to discounted insurance schemes. Leading Suppliers offer Club members discount. The Club publishes a full colour yearbook full of interesting stories, projects and helpful articles. The Club offers free dating certificates and insurance valuations. New members recieve an enamel badge and cloth sew on badge or a Z1 Owners Club keyring. We keep in stock several factory special tools which are available for members' use by return post. A wide range of Club merchandise and some specially manufactured spares are also available. Several Area Groups hold monthly meetings and there are a number of Club rallies in the summer months. The more you put into the Club, the more you will get out of it, and we hope you'll find being a Z1 Owners Club member useful and worthwhile. Club Membership runs for 12 months from the date of joining. Renewals can be either for a 12 month period (at full renewal price) or, from April onwards, a part year to bring you up to the end of December; in which case the renewal fee is automatically reduced by £2 per quarter. Members are entitled to get the reduced renewal rate if they renew their membership within 3 months of their membership expiring. 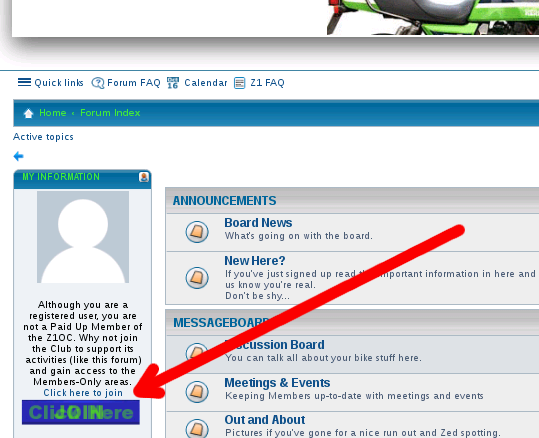 The second way is to login/register on the Club Forum and click on the Join/Renew links at the top of the left hand column. Joining or renewing through the forum links allows the system to instantly update your membership status and we most strongly encourage you to use this method. Badges or Keyring: Cloth Badge: Enamel Badge: Keyring: Please pick any two. Additional Donation (£): An extra pound will cover the Paypal fees or if you're just feeling flush make an extra donation to Club funds. Amount Due (£): (reduction applied for part year renewals. We generally respond to all membership requests within 28 days but please be patient during busy periods holidays etc. New Memberships run for 12 months from the date of joining through to the start of the following month. When renewing, you have the option of renewing for a full 12 months or, from April onwards, for a part year to bring your renewal date to the end of December; in which case the renewal fee is reduced appropriately.